Today the puck will drop for the Wisconsin Men’s hockey team (22-10-2, 13-6-1 Big Ten). Earning a first round bye with their 2nd-seed, Wisconsin will face Penn State in the second round. The 6th seeded Nittany Lions won their opening match against 3rd-seeded Michigan 2-1 in double overtime. Wisconsin is undefeated (4-0-0) against Penn State this season. The NCAA Division 3 Frozen Four Ice Hockey Championships are on tap this weekend. Semi-final action this afternoon has top ranked St. Norbert College facing Geneseo State at 3pm. St. Norbert has been to the Frozen Four 8 times and won 3 National titles. UW-Stevens Point faces Oswego State in the other semi-final. win over Minnesota State on Saturday night. It moved the Badgers past the Mavericks into 6th place in the WCHA, tied with Minnesota-Duluth. The win also put the Badgers (8-7-5 overall, 6-5-5 WCHA) above .500 for the first time this season. After a scoreless first period, former Mr. Hockey in Wisconsin, Jefferson Dahl put the Badgers in front 1-0 with a goal at 16:55. Matt Leitner tied the game 1-1 with a goal midway through the third. Then in overtime, it was time for Ramage to play hero for Wisconsin again, extending Wisconsin’s unbeaten streak to 10 games (7-0-3), earned its sixth straight win and third straight series sweep. The weekend sweep was also the first ever in Mankato by the Badgers. The Badgers return to the Kohl Center this coming weekend and will face Miami (Ohio) in a two-game series. Mankato on Friday night. It marks the first time Wisconsin (7-7-5, 5-5-5 WCHA) has won a WCHA game that has went into overtime since the 2006-2007 season. The Badgers have now won 5-straight and puts them in a tie for seventh place in the Western Collegiate Hockey Associate (WCHA) with Minnesota Duluth at 15 points. Both Wisconsin and UMD are just 1-point behind the Mavericks. 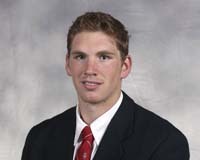 The game was scoreless until Wisconsin’s Joe Faust lit the lamp at the 18:02 mark of the 1st period. Minnesota State evened the score at the 19:16 mark with a Matt Leitner goal, and the first period ended at 1-1. The Wisconsin Badger hockey team swept the Alaska-Anchorage Seawolves with a 1-0 win Saturday night. The Badgers (6-7-5, 4-5-5 WCHA) have won their last four games, and have recovered well from a dismal 1-7-2 start to their season. Currently, Wisconsin sits two points away from securing a home playoff spot in the WCHA tournament with an important road series against Minnesota State next weekend. In the win Saturday night, Derek Lee scored the lone goal in the second period at the 2:56 mark. Alaska-Anchorage goalkeeper Rob Gunderson was kept busy the entire game making 21 saves for the Seawolves. Badger goalkeeper Joel Rumpel was forced to make 12 saves in the shutout. Wisconsin travels to Minnesota State next weekend and will try and continue this winning streak they have created. The last time the Wisconsin Badger hockey team lost a game, it was Thanksgiving. Needless to say, they have been on a roll since then. They are undefeated in their last seven games, and on a three game win streak. Friday’s 5-3 win over the Alaska-Anchorage Seawolves allowed the team to start 2013 off on a strong win. The Badgers (5-7-5, 3-5-5 WCHA) scored early in the first period through senior defenseman John Ramage, lighting the lamp at the 2:56 mark. Sophmore forward Joseph LaBate was next to get on the Badger scoresheet, making the game 2-0 at the 8:17 mark. Matt Bailey brought the game within reach for the Seawolves (3-10-4, 1-9-3 WCHA), making the game 2-1 with a goal at the 8:10 mark. Alaska-Anchorage continued the pressure, forcing another nine saves from Badger goalkeeper Landon Peterson for the remainder of the second period. In the third period, Wisconsin scored two goals within 70 seconds to make the game 4-1. Junior forward Michael Mersch scored at the 6:29 mark to increase the lead to 3-1. Tyler Barnes, another junior forward, furthered the lead with a goal at the 7:34 mark in the third period. The Seawolves mounted a comeback midway through the third period, scoring at the 11:04 and 12:19 mark. Blake Tatchell scored first, making the game 4-2, and Jordan Kwas scored second, making the game 4-3. Badger junior forward Mark Zengerie put the proverbial “nail in the coffin” at the 19:29 mark, scoring on an empty net and making the game 5-3. Wisconsin goalkeeper Landon Peterson recorded 26 saves in the win, and Alaska-Anchorage goalkeeper Chris Kamal recorded 22 saves. The Badgers look to make it four wins in a row as they take on the Alaska-Anchorage Seawolves in the finale of their two game series Saturday night. The Wisconsin Badgers men’s hockey team is now undefeated in their last six games, and swept Alabama Huntsville with a 4-1 win Friday night. The Badgers (4-7-5, 2-5-5 WCHA) rolled over the Chargers 5-0 Thursday night. The Wisconsin Badger hockey team tied the Michigan Tech Huskies 3-3 in a game that saw over 60 shots on goal. The Badgers (2-7-5, 2-5-5 WCHA) had 37 shots on goal, and scored two goals in the first period. Junior forward Tyler Barnes opened the Badger scoring at the 6:29 mark, and was followed by sophomore forward Brendan Woods at the 8:56 mark in the first period. Michigan Tech was able to respond to the Badger’s first goal in the opening period with a score from Malcolm Gould at the 7:43 mark. The second period saw a 2-1 Badger advantage, and was increased to 3-1 thanks to a goal from sophomore forward Joseph LaBate at the 4:04 mark. Michigan Tech rallied with a goal four minutes later thanks to Steven Seigo to make the game 3-2 at the 8:39 mark. The third period saw the equalizer from the Huskies to tie the game up at 3-3 through a Blake Hietala goal at the 3:06 mark. Overtime could not separate the two teams, and the game ended in a draw. The Badgers, who are undefeated in their last four games (1-0-3), look to continue this undefeated streak at home December 13 and 14 as they take on Alabama-Huntsville in a two-game series. The Wisconsin Badger hockey team could not be separated from the Michigan Tech Huskies Friday night, as the teams drew 1-1. The Badgers (2-7-4) and Huskies (4-8-2) could only muster six shots each in the first period. The second period was a different story as each team had 11 shots, but could not find the back of the net. At the 8:42 mark in the third period, sophomore forward Blake Pietila lit the lamp to give Michigan Tech the lead at 1-0. 12 minutes later, at the 16:49 mark, the Badgers equalized on a power play through junior forward Tyler Barnes. Neither team could break the 1-1 tie at the end of regulation, and while Wisconsin held a 4-3 shooting advantage in overtime, the game ended 1-1. Wisconsin goalkeeper Landon Peterson and Michigan Tech goalkeeper Kevin Genoe each recorded 30 saves in the game. The Badgers take on the Huskies for the second of their two game series at the Kohl Center Saturday night. The Minnesota State Mavericks (5-5-2, 3-5-0 WCHA) completed their sweep over the Wisconsin Badgers (1-7-2, 1-5-2 WCHA) with a score of 4-2 on Saturday night. The Mavericks jumped out to an early lead with a goal provided by Matt Leitner at the 4:38 mark in the first period. At the 6:45 mark of the first period, the Badgers equalized on a power play goal from Jake McCabe. Minnesota State was not done scoring goals in the first period however. Eriah Hayes, at the 13:29 mark, and Bryce Gervais, at the 15:10 mark, made the score 3-1 in the first period. The second period saw a Badger goal from Michael Mersch, at the 0:49 mark, saw the game at 3-2. The third period saw the decisive goal go to Minnesota State’s Eriah Hayes at the 3:54 mark to put the game out of the Badgers’ reach. The Badgers travel to the University of Denver for a two-game road series next weekend. The Wisconsin Badgers (1-6-2, 1-4-2 WCHA) fell to the Minnesota State Mavericks (4-5-2, 2-5-0 WCHA) Friday night by a score of 4-2. The Mavericks struck first through Dylan Margonari at the 2:11 mark in the first period. The Badgers’ Michael Mersch responded quickly, scoring at the 3:22 mark to level the game at 1-1. Matt Leitner of Minnesota State scored at the 10:18 mark to give them the lead, 2-1. The second period saw one lone goal from the Badgers’ Ryan Little at the 11:57 mark to even the game up at 2-2. The Mavericks scored two goals in the third period through Eriah Hayes, at the 5:48 mark, and Eli Zuck, at the 19:15 mark, to put the game out of hand at 4-2. Minnesota State goalkeeper Stephon Williams had 32 saves in the victory, while Wisconsin goalkeeper Landon Peterson had 20 saves. The Wisconsin Badgers look to get back on track as they play Minnesota State Saturday night in the finale of this two-game home series.